☞ DATE & TIME: Friday February 1st – 🍷Drinks and snacks available from 8pm at the cinema bar; Screening at 9pm. ☞ TICKETS: €9 full price; €7.50 for students and all other concessions. 🎟Tickets available AT THE DOOR ONLY. 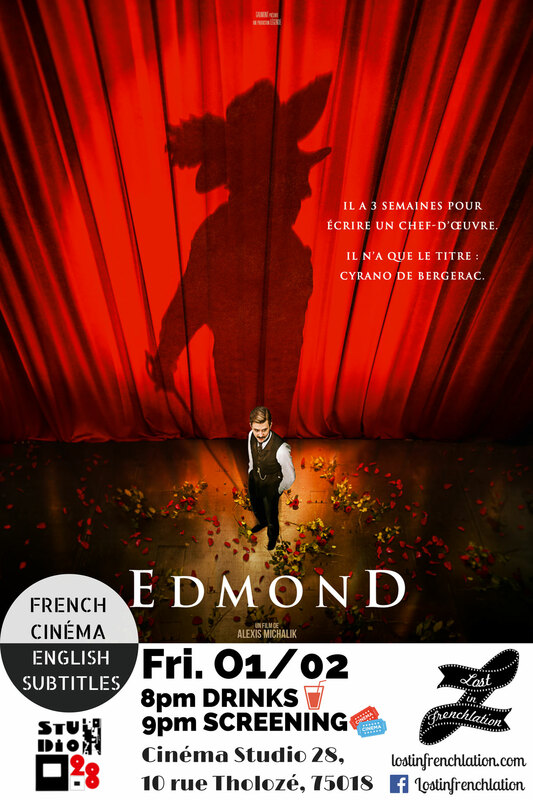 Set against the vibrant backdrop of Belle Epoque Paris, Michalik narrates the creation of Edmond Rostand’s 1897 « Cyrano de Bergerac » – one of the most beloved plays in the French repertoire – in « Edmond » his big screen adaptation of his stage hit. We’ll bring it to you with English subs on the 1st of February at the iconic Studio 28 cinema! The screening will take place at cinéma Studio 28 (the oldest cinema in Paris! ), located in the beautiful area of Montmartre. We’ll be hosting cocktail hour with snacks (home-made mulled wine €4.00, or €6.00 with a packet of popcorn) at 8pm. At 9pm, the screening begins! Tickets available at the door only – please arrive early to avoid disappointment.